I have given it a lot of though, and I've determined that this is my ideal presidential candidate. He has the intellect, moral fiber, humility and eloquence of our 16th president, Abraham Lincoln, as well the guts, determination, strong will and faith in the American ideal possessed by Marvel's Star-Spangled Avenger, Captain America. And he's a Lego. Because they're fun. 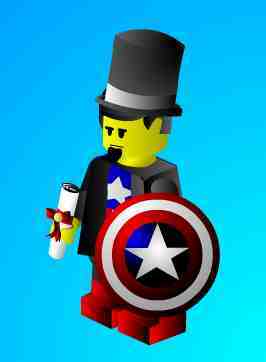 Lego Captain Abe in '08... because you already know he'll be better than anyone else they put up.